5 Bedroom House For Sale in for Guide Price £1,250,000. Siston Court is a spectacular Grade I listed Tudor mansion. Originally built for the Denys family in the late 16th Century and believed to have been visited by Anne of Denmark Queen Consort of King James I in 1613, and possibly by Oliver Cromwell during the English Civil War. It was used to house evacuees from London by the Anglo-American Relief Fund during the Second World War and the main block was later subdivided into six individual houses after the war. All are independent properties and The West Wing occupies a major piece of the centre of the house. The West Wing is one of the finest sections of this spectacular Tudor mansion and enjoys the single story formal entrance porch as well as a plethora of original and outstanding period features. Awarded Grade I listed status, it is one of the most rare and important buildings in the UK due to its historic importance and also the rarity of its architecture. The volume, space and light is breath-taking throughout and a real contrast to the austere exterior. During the original conversion and latterly the modernisation by the current owners, the property has been updated and maintained wonderfully with much love and care throughout. The current owners have incorporated bespoke furniture and sympathetic detailing which has both enhanced and maintained the charming feel. The impressive exterior gives way to a comfortable interior, the first glimpses of which you see upon opening the cross planked studded door which leads into the entrance vestibule. This oak-panelled entrance gives both a sense of history and importance with ornate plaster details and large flagstone flooring. This in turn leads, by glazed door, into the spectacular entrance/reception. This large room doubles as a sitting room and study and displays some fine features including hand carved ceiling beams, large decorative ceiling work and stone fireplace. This has been further enhanced with bespoke cabinetry. 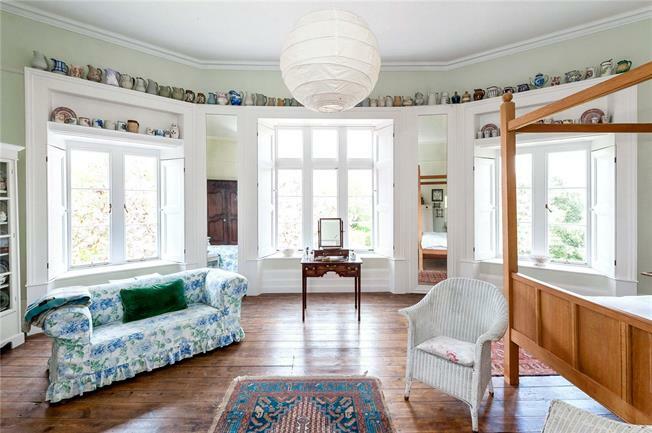 The windows throughout are predominantly mullion and transom leaded light windows with much of the original glazing, providing security and wonderful light. The windows are backed up with large wooden shutters. The spectacular main drawing room has exceptionally generous proportions with wonderful ceiling height and a bank of sash windows taking up the majority of the westerly elevation and allowing the afternoon sun to flood into this lovely room. The windows are near floor to ceiling and are encased by renovated shutters. The ceiling cornice work, lower panelling and carved wooden fireplace add to the charm and warmth of this room as do the stripped pine floor boards. The snug, with its beautiful curved pine door, is a wonderful alternative to the generous proportions of the drawing room. It is an intimate, cosy room with beamed ceiling, charming window seat, period oak shelving and ornate fire surround, which offers yet more surprises throughout. The kitchen/breakfast room has a range of hand built wooden units sympathetic to the origins of the building, a number of integrated appliances, a two oven AGA and space for dining table and chairs as well as independent access to the front parking area. The hand carved and intricate oak staircase, commissioned by the current owners in the 1990’s leads, via a half landing mezzanine bedroom with en suite, to the top floor bedroom accommodation. This again has generously proportioned rooms with high ceilings and a range of interesting and beautiful features including marble fireplaces, thick wide wooden boards and large window areas. There is a choice of master bedrooms depending on preferred light and views and the current owners use the rear bedroom which makes the most of the views over the spectacular grounds through its seven large sash windows. All other bedrooms are of good proportions with independent views. One has an en suite bathroom and there is a large family bathroom with freestanding roll top bath, shower and WC. Siston Court lies off Siston Lane, and access is via a private driveway which is entered between two early 19th Century octagonal stone gatehouses designed by the gentleman architect Sanderson Miller. The tree-lined drive then forks and the left hand arm leads to a communal parking area at the front of the main Court. The grounds, which completely surround Siston Court, are owned by and split formally into separate garden areas. The building was originally constructed in this location due to its vantage point over the surrounding countryside and the City of Bristol. The A4174 bypass gives good access to both the commercial centre of Bristol and the heritage city of Bath. There is a choice of schooling in both Bristol and Bath with a number of primary and secondary state schools nearby. Access to the motorway system is via either the M32 or the Bath junction of the M4. For rail links both Bristol Parkway and Bath Spa high speed train links to London. A secondary right-hand fork off the main drive leads to the rear of the walled garden which has private access to both the garaging and the walled garden. The West Wing is the centrepiece of the house and benefits from having a large section of the main formal gardens as well as a substantial proportion of the walled kitchen garden. The grounds have been beautifully maintained by the current owners and are a tribute to the house. Immediately to the rear you will find a patio area and formal level lawn surrounded by yew hedge and dotted with a range of wonderful mature trees including copper beech, flowering cherry, yew, and clipped hazel. The lawned grounds continue via a central viewing area onto a flowering spring meadow surrounding a mature mulberry and with the rolling fields beyond. The spring meadow is awash with cowslips and other wild flowers and is bordered by further beech and oak trees surrounded by bluebells, fritillaries, white bells and primroses. The walled garden is linked by two arched openings and is no less impressive than the main garden. It is formalised with a number of herbaceous beds giving wonderful year round foliage and flowers. There are a number of vegetable beds including areas for fruit cages and fruit beds, a pond and further mature and immature fruit trees including quince and medlar. The garage block, rear access gates and a potting shed are also located within the walled garden. Agents Note: There is a right of way by the owner of The South Wing across the bottom of The West Wing garden to access their portion of the walled garden.